Curses is a great game that will have everyone laughing as they role play. How good is your Australian accent? The game of Curses is filled with challenges that you have to accomplish in order to stay in the game. You have three chances to mess up before you'll find yourself out of the game and laughing while everyone else keeps going. Players must act out their actions while obeying their curses. The last player standing will be the Curses champion. Curses is easy to learn, but it can be quite difficult to stop laughing long enough to remember all of your curses. 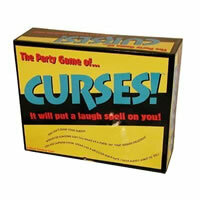 Check out Curses for your next party or get-together. The goal of Curses is to be the last one remaining when all your opponents have each broken three of their curses. Curses family game comes with 60 Curse Cards, 60 Challenge Cards, 1 bell, and the Curses rules and instructions sheet. Please keep in mind that the official Curses party rules and instructions could be different depending on the game version you have. The rules below are some of the exact directions on how to play Curses. Share with us your comments, funny stories, tips, advice, strategies, creative ways to play, questions about how to play, problems with the rules or anything you want about Curses. All submissions will be reviewed within 24 hours. Click here to add your Curses comments. Can someone please tell me what you do with the Ding card in the "More Curses" game pack? What purpose does the curse card serve? We just played this at a friend party and it was a lot of fun. You'll definitely have to get out of your comfort zone but as long as you roll with it it's hilarious. We had more than the recommended people but we made it work.